You cannot listen to the pronunciation of shang jiao because your browser does not support the audio element. Note: This Chinese character can also be pronounced shàng liáo. However, with a different pronunciation, the meaning of the character will change as well (not yet available in this dictionary). 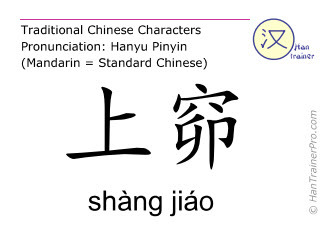 The modern (simplified) Chinese characters of shàng jiáo are identical with the traditional characters displayed above.